SPRINGFIELD – A plan by State Senator Scott Bennett (D-Champaign) would protect the identifying information of a victim in the middle of a sexual assault investigation. Senate Bill 2133 intends to change the definition of “private information” in the Freedom of Information Act (FOIA) to include the name and any identifying information of a victim in a sexual assault investigation. Currently, the private information of a victim is not protected from private attorneys and media submitting FOIA requests. As a former prosecutor, Bennett has used his experiences to push for legislation to assist survivors of sexual assault. He is also the sponsor of a 2017 law that eliminated the statute of limitations on sexual crimes against children. SB 2133 was approved by the Senate Judiciary Committee and is scheduled for consideration in the Senate. 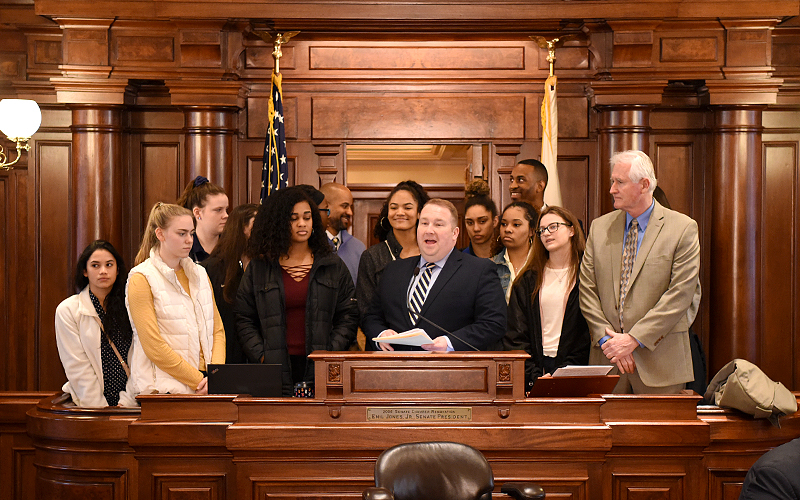 SPRINGFIELD – State Senator Scott Bennett (D-Champaign) welcomed the players and coaching staff of the Schlarman Academy girls’ basketball team to the Illinois Capitol today to recognize their second consecutive state title. Bennett was joined on the Senate floor by the players and Head Coach Keith Peoples as he presented the team with a special tribute honoring their accomplishment. Last month, the Lady Hilltoppers won their IHSA Class 1A State Championship Game with a 63-36 triumph over Lanark Eastland bringing home Danville’s second state title. SPRINGFIELD – State Senator Scott Bennett (D-Champaign) was joined by Illinois Department of Agriculture Director John Sullivan today to address the issue of farm chemical runoff polluting Illinois waterways. Sullivan provided testimony in the Senate Environment and Conservation Committee to support Senate Resolution 52, sponsored by Bennett. It calls for further steps in a plan to protect water quality by limiting nitrogen and phosphorus runoff from agricultural operations – nutrients with important beneficial effects in farming but with potentially harmful environmental consequences. The effort to protect water quality in Illinois ultimately would benefit the Mississippi River environment all the way down to the Gulf of Mexico, where nutrient runoff has contributed to a dead zone. Developed in 2015, the Illinois Nutrient Loss Reduction Strategy is a collaborative effort between Illinois’ Environmental Protection Agency, Department of Agriculture and a broad group of stakeholders like the Illinois Stewardship Alliance, all committed to protecting and conserving state natural resources. 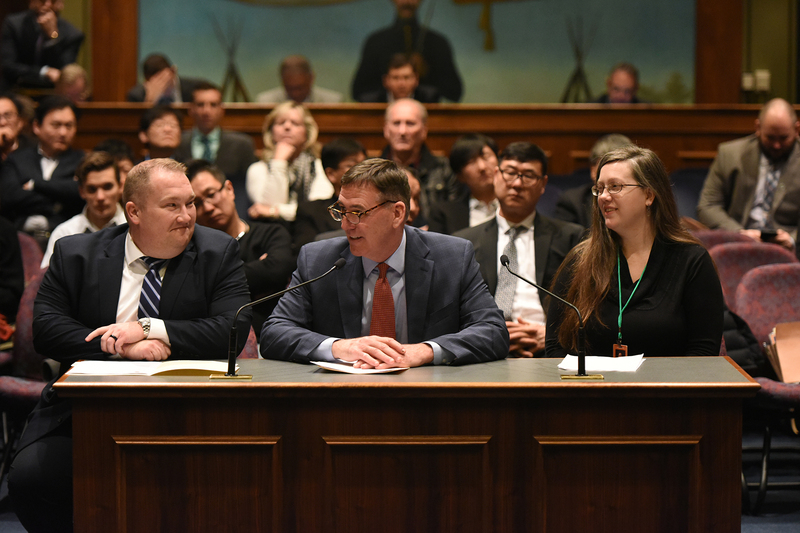 SPRINGFIELD – State Senator Scott Bennett’s (D-Champaign) bill to ensure property tax relief for spouses of veterans with disabilities passed the Senate Veterans Affairs Committee this week. Senate Bill 1579 would allow the rights of a veteran to pass to their spouse during the application process for a homestead exemption to pass through to the spouse of a veteran, if the veteran passes away before the application is completed.